Welcome to our log cabins, created by us especially for you. Each log cabin has it's own private hot tub. This contemporary self catering accommodation is on a secluded part of our working family farm. Each cabin sleeps 2 to 6 guests comfortably and provides both space and peace for everyone to enjoy, leaving you with lovely memories, especially watching the stars from the gorgeous hot tub. "A shining example to other holiday home owners"
Whatever your holiday requirements, a romantic break, an idyllic honeymoon location, a relaxing family holiday or a long awaited family reunion. The high levels of attention to detail in each cabin, along with the personal service provided by Sarah and Hugh will make a truly memorable occasion for you all. Well equipped and stylish kitchen where you can enjoy preparing and serving that special meal in the open plan dining and lounge area. Enjoy breakfast on the balcony watching buzzards soar above you, and spend long lazy afternoons in your private hot tub. An ideal recipe for a peaceful holiday experience. The under floor heating is provided by ground source heat pump and the water heated by solar panels. We do not allow pets in any of our log cabins. No smoking permitted anywhere near the log cabin, decking or hot tub. All bed linen and towels supplied for number of guests booked. Please note when two adults make a booking, only the king bedroom will be made available unless otherwise specified to Sarah at time of booking (please bring towels for hot tub and beach use). Cots and highchairs £10 each per week per item (own cot bedding required). A five minute walk takes you to the village where the shop has locally sourced produce and the family run pub serves home cooked meals daily. Within the area there are many activities including golf, sailing, fishing, quad biking, clay target shooting, mountain biking and walking. Further afield are beautiful beaches, castles and plenty of market towns. The log cabins are set in a secluded area on our family farm, with carefully planted, naturalistic landscaped grounds surrounding you, including fruit bearing trees and shrubs. Stream and Kingfisher pond a short walk away, and stunning views all around, all within walking distance from the village shop and pub. Plenty of space for children to play on the grass around the cabins. Lovely area where dragonflies, birds and flowers can be seen. Camp fire and picnic area by a Druid stone circle where you can toast marshmallows under the stars. 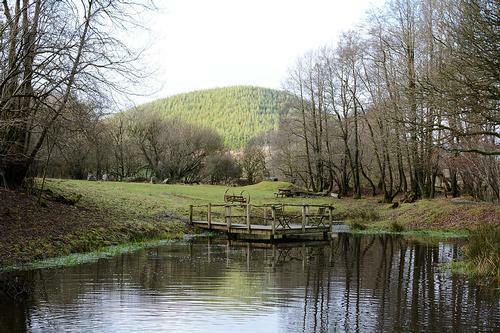 Corris Craft Centre and King Arthur's Labyrinth, Centre for Alternative Technology are 30 minute drive away. Several seaside towns and long sandy beaches in Borth, Ynyslas, Aberdyfi, Barmouth to name but a few. Mountain walks and lakeland scenery. Mountain biking, fishing, quad biking, sailing, shooting, golf all a short drive from your cabin. From take-away to fine dining, all are available locally. We can recommend the Aleppo Merchant, the village pub, serves lunch and evening meals daily. The Waggon and Horses, Newtown is family friendly. Ty'n Y Cornel, Talyllyn Lake offers great food and even better views. Cross Foxes, Dolgellau has a contemporary feel with a local menu. Information about places to eat out and take-away are in the welcome folder in the cabin. Payment by cheque or bank transfer. Price includes private hot tub, steam sauna shower, heating, all bed linen and towels (except hot tub and beach towels). Your booking will be held for 5 days after first contacting us, when 50% deposit will be required along with the booking form to secure your holiday. Six weeks prior to the start of your stay the balance will be due along with a £100 returnable damage bond. (No reminder sent).